I have just got an email from my customer describing the weird issue with VMware vCenter Server Appliance (aka VCSA). Error message - This appliance cannot be used or repaired because of failure was encountered. You need to deploy a new appliance. The error message includes a resolution. Deploy a new appliance. The recommended solution is the last thing a typical vSphere admin would like to resolve such an issue. Fortunately enough, there is another solution/workaround. Putty/SSH to vCenter server appliance. Login to VCSA using the root credentials. Move the /var/vmware/applmgmt/backupRestore-history.json file to /var/tmp/. 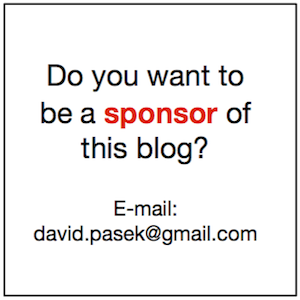 Hope this helps other folks in VMware community. Yesterday, I have got a very interesting question. I have been asked by a colleague of mine if Intel SGX can be leveraged within VMware virtual machine. We both work for VMware as TAMs (Technical Account Managers), therefore we are the first stop for similar technical questions of our customers. However, support of SGX is mandatory for such type of application, therefore if Virtual Machines do not support it, they are forced to run it on bare metal. We, as VMware TAMs, can leverage a lot of internal resources, however, I personally believe that nothing compares to the own testing. After few hours of testing in the home lab, I feel more confidential to discuss the subject with other folks internally within VMware or externally with my customers. By the way, that's the reason I have my own vSphere home lab and this is a very nice example of justification to me and my family why I have invested a pretty decent money into the home lab in our garage. But back to the topic. What about CPUID?The CPUID instruction is not sufficient to detect the usability of Intel SGX on a platform. It can report whether or not the processor supports the Intel SGX instructions, but Intel SGX usability depends on both the BIOS settings and the PSW. Applications that make decisions based solely on CPUID enumeration run the risk of generating a #GP or #UD fault at runtime.In addition, VMMs (for example, Hyper-V*) can mask CPUID results, and thus a system may support Intel SGX even though the results of the CPUID report that the Intel SGX feature flag is not set. For our purpose, CPUID detection should be enough as we can test it on bare metal OS and later on Guest OS running inside Virtual Machine. The rest of testing is on the application itself but it is out of this blog post scope. INPUT EAX = 12H: Returns Intel SGX Enumeration InformationWhen CPUID executes with EAX set to 12H and ECX = 0H, the processor returns information about Intel SGX capabilities. and you can see the application (test-sgx) output with information about SGX support. The output should be similar to this one. First of all, let's do three tests of SGX support on bare metal (Intel NUC 6i3SYH). I have installed FreeBSD 11.0 on USB disk and tested SGX with all three BIOS options related to SGX. So, we have validated that SGX capabilities are available on FreeBSD operating system running on bare metal when SGX is enabled in BIOS. Next step is to repeat tests on Virtual Machines running on top of VMware hypervisor (ESXi) installed on the same physical hardware (Intel NUC 6i3SYH). At the moment, I have vSphere 6.5 (ESXi build 7388607) which support VM hardware up to version 13. Let's run SGX tests on very old VM hardware 4 and on fresh VM hardware 13. All test with VMs were executed on physical system with explicitly enabled SGX in BIOS. To leverage Intel SGX CPU capabilities in the application, the physical hardware must support SGX and SGX must be enabled on BIOS. Note: Explicitly enabled SGX within BIOS has been successfully tested in operating system FreeBSD 11 running on bare metal (physical servers). It might work with BIOS option "Software Controlled" but it would require software enablement within Guest OS. I was not testing such scenario, therefore another testing would be required to prove such an assumption. Operating system FreeBSD 11 has been tested on bare metal with enabled SGX in BIOS and in such configuration SGX CPU capabilities has been successfully identified within operating system. 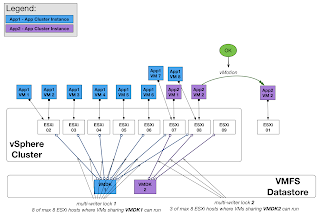 SGX support in virtual machines on top of VMware Hypervisor (ESXi 6.5) has been tested solely on physical hardware with SGX explicitly enabled in BIOS. 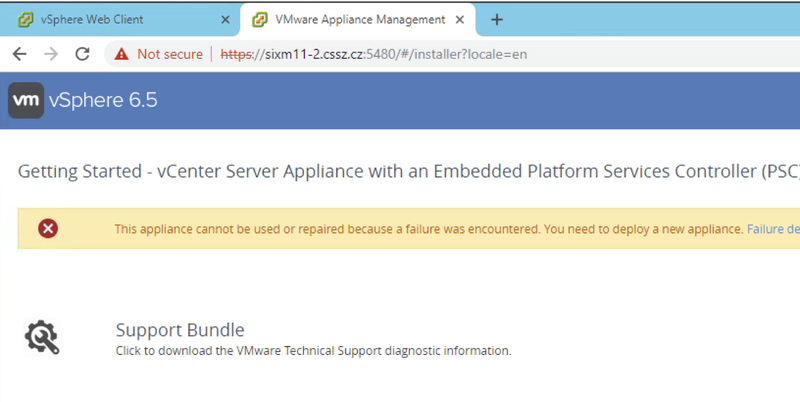 Unfortunately, SGX has NOT been successfully identified even on the latest VM hardware for vSphere 6.5 (VM Hardware ver 13) even the CPU capabilities identified in VM hardware 13 by Guest Operating System are significantly extended in comparison to VM hardware 4. I will try to upgrade my home lab to the latest vSphere 6.7 U1 and do additional testing with VM hardware version 14. In the meantime, I will open discussion inside VMware organization about SGX support because, at the moment, one large VMware customer cannot virtualize a specific type of applications even they would like to. 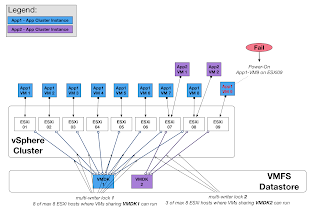 VMFS is a clustered file system that disables (by default) multiple virtual machines from opening and writing to the same virtual disk (vmdk file). 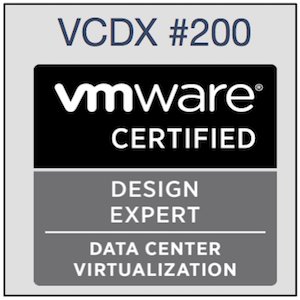 This prevents more than one virtual machine from inadvertently accessing the same vmdk file. This is the safety mechanism to avoid data corruption in cases where the applications in the virtual machine do not maintain consistency in the writes performed to the shared disk. However, you might have some third-party cluster-aware application, where the multi-writer option allows VMFS-backed disks to be shared by multiple virtual machines and leverage third-party OS/App cluster solutions to share a single VMDK disk on VMFS filesystem. These third-party cluster-aware applications, in which the applications ensure that writes originate from multiple different virtual machines, does not cause data loss. Examples of such third-party cluster-aware applications are Oracle RAC, Veritas Cluster Filesystem, etc. 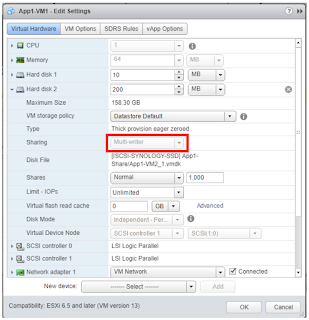 There is VMware KB “Enabling or disabling simultaneous write protection provided by VMFS using the multi-writer flag (1034165)” available at https://kb.vmware.com/kb/1034165 KB describes how to enable or disable simultaneous write protection provided by VMFS using the multi-writer flag. It is the official resource how to use multi-write flag but the operational procedure is a little bit obsolete as vSphere 6.x supports configuration from WebClient (Flash) or vSphere Client (HTML5) GUI as highlighted in the screenshot below. The virtual disk must be eager zeroed thick; it cannot be zeroed thick or thin provisioned. 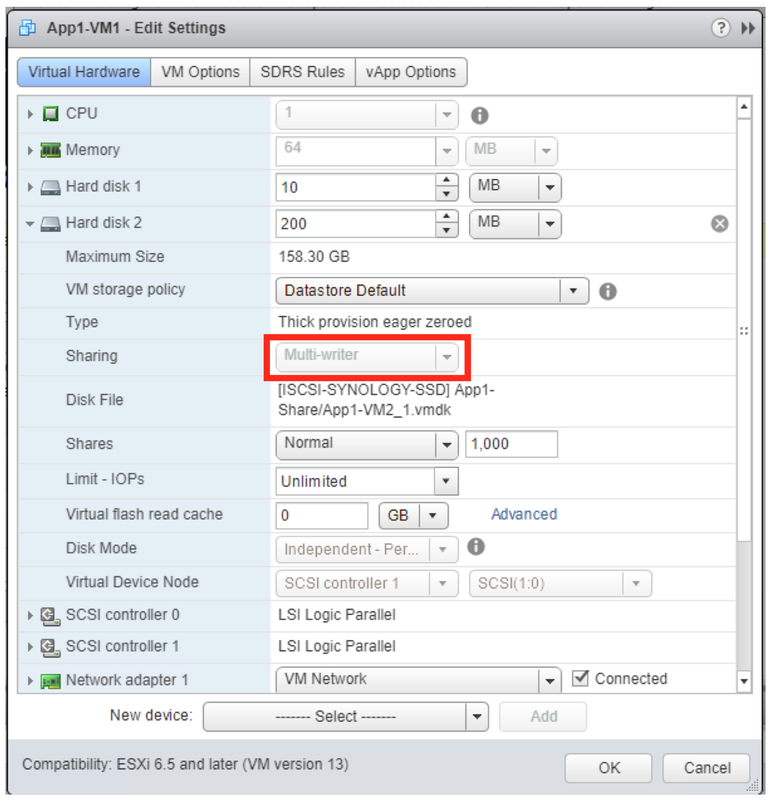 Sharing is limited to 8 ESXi/ESX hosts with VMFS-3 (vSphere 4.x) and VMFS-5 (vSphere 5.x) and VMFS-6 in multi-writer mode. Hot adding a virtual disk removes Multi-Writer Flag. Let’s focus on 8 ESXi host limit. The above statement about scalability is a little bit unclear. That’s the reason why one of my customers has asked me what does it really mean. I did some research on internal VMware resources and fortunately enough I’ve found internal VMware discussion about this topic, so I think sharing the info about this topic will help to broader VMware community. The best way to fully understand specific behavior is to test it. That’s why I have a pretty decent home lab. However, I do not have 10 physical ESXi host, therefore I have created a nested vSphere environment with vSphere Cluster having 9 ESXi hosts. You can see vSphere cluster with two App Cluster Instances (App1, App2) on the screenshot below. 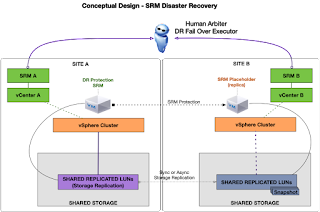 Application Cluster instance App1 is composed of 9 nodes (9 VMs) and App2 instance just from 2 nodes. Each instance is sharing their own VMDK disk. The whole test infrastructure is conceptually depicted on the figures below. Test Step 1: I have started 8 of 9 VMs of App1 cluster instance on 8 ESXi hosts (ESXi01-ESXi08). 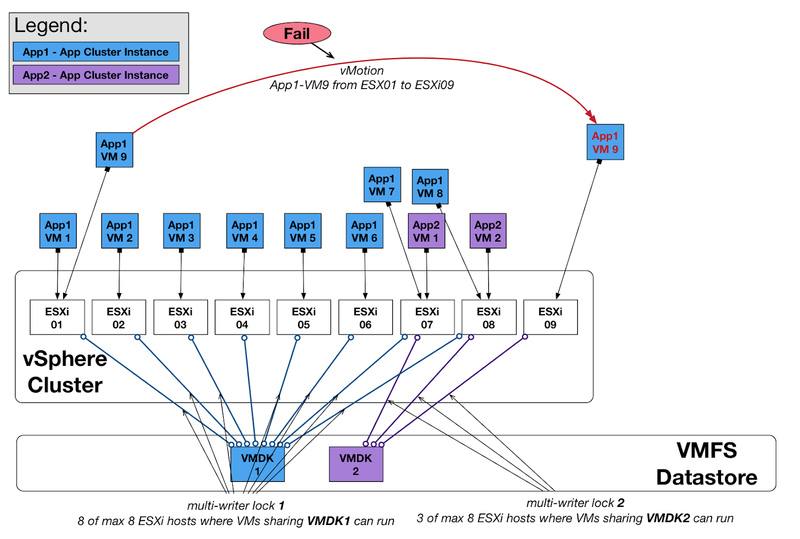 Such setup works perfectly fine as there is 1 to 1 mapping between VMs and ESX hosts within the limit of 8 ESXi hosts having shared VMDK1 opened. Test Step 2: Next step is to test the Power-On operation of App1-VM9 on ESXi09. Such operation fails. This is expected result because 9th ESXi host cannot open the VMDK1 file on VMFS datastore. The error message is visible on the screenshot below. Test Step 3: Next step is to Power On App1-VM9 on ESXi01. This operation is successful as two app cluster nodes (virtual machines App1-VM1 and App1-VM9) are running on single ESXi host (ESX01) therefore only 8 ESXi hosts have the VMDK1 file open and we are in the supported limits. Test Step 4: Let’s test vMotion of App1-VM9 from ESXi01 to ESX09. Such operation fails. This is expected result because of the same reason as on Power-On operation. App1 Cluster instance would be stretched across 9 ESXi hosts but 9th ESXi host cannot open VMDK1 file on VMFS datastore. The error message is a little bit different but the root cause is the same. Test Step 5: Let’s test vMotion of App2-VM2 from ESXi08 to ESX09. Such operation works because App2 Cluster instance is still stretched across two ESXi hosts only so it is within supported 8 ESXi hosts limit. 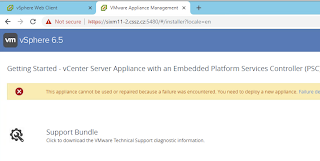 Test step 6: The last test is the vMotion of App2-VM2 from vSphere Cluster (ESXi08) to standalone ESXi host outside of the vSphere cluster (ESX01). Such operation works because App2 Cluster instance is still stretched across two ESXi hosts only so it is within supported 8 ESXi hosts limit. vSphere cluster is not the boundary for multi-write VMDK mode. Q: What exactly does it mean the limitation of 8 ESXi hosts? 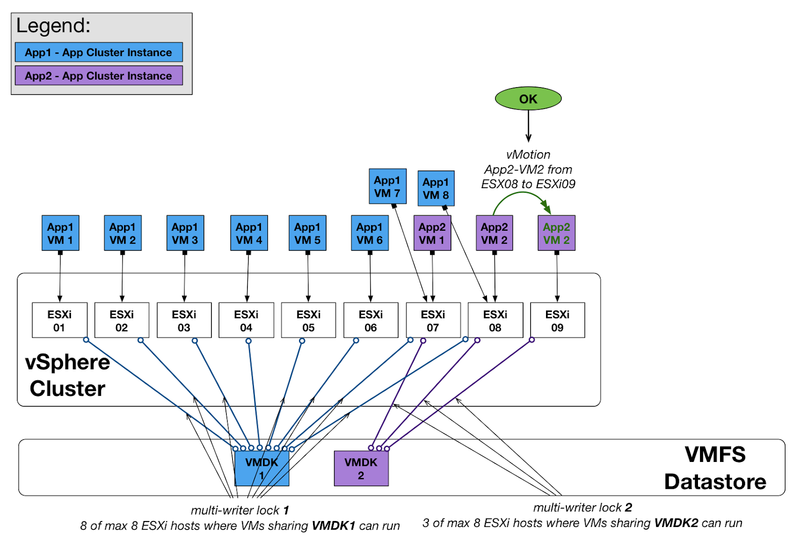 A: 8 ESXi host limit implies how many ESXi hosts can simultaneously open the same virtual disk (aka VMDK file). If the cluster-aware application is not going to have more than 8 nodes, it works and it is supported. Details and various scenarios are described in this article. Q: Where are stored the information about the locks from ESXi hosts? The only difference is that multi-write VMDKs can have multiple locks as is shown in the screenshot below. Q: Is it supported to use DRS rules for vmdk multi-write in case that is more than 8 ESXi hosts in the cluster where VMs with configured multi-write vmdks are running? A: Yes. It is supported. DRS rules can be beneficial to keep all nodes of the particular App Cluster Instance on specified ESXi hosts. This is not necessary nor required from the technical point of view, but it can be beneficial from a licensing point of view. Q: How ESXi life cycle can be handled with the limit 8 ESXi hosts? · vMotion – supported by VMware for Oracle RAC only and limited to 8 ESX/ESXi hosts. Note: other cluster-aware applications are not supported by VMware but can be supported by partners. For example, Veritas products have supportability documented here https://sort.veritas.com/public/documents/sfha/6.2/vmwareesx/productguides/html/sfhas_virtualization/ch01s05s01.htm Please, verify current supportability directly with specific partners. 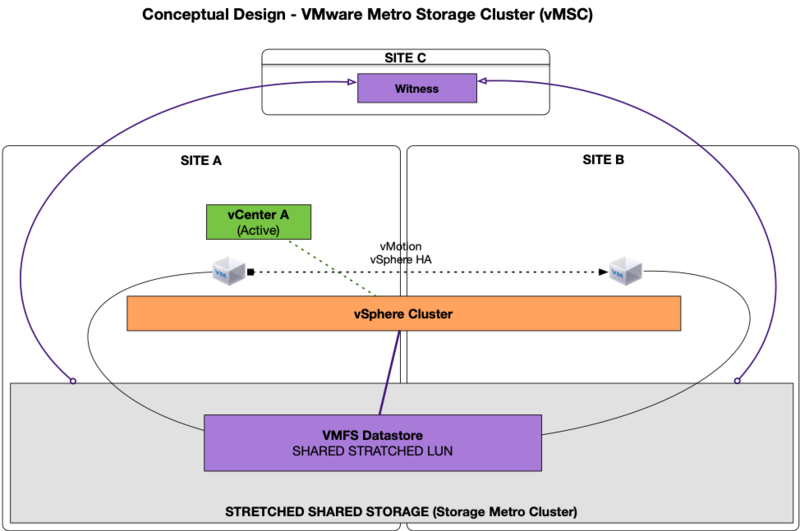 Q: Is it possible to migrate VMs with multi-write vmdks to different cluster when it will be offline? A: Yes. VM can be Shut Down or Power Off and Power On on any ESXi host outside of the vSphere cluster. The only requirement is to have the same VMFS datastore available on source and target ESXi host. 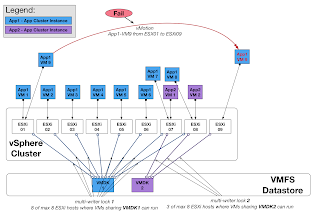 Please, keep in mind that the maximum supported number of ESXi hosts connected to a single VMFS datastore is 64.